If you’re a uni student like me, I think its easy to agree we deserve a lil treat at least once a month. This is where The Unibox* comes in. 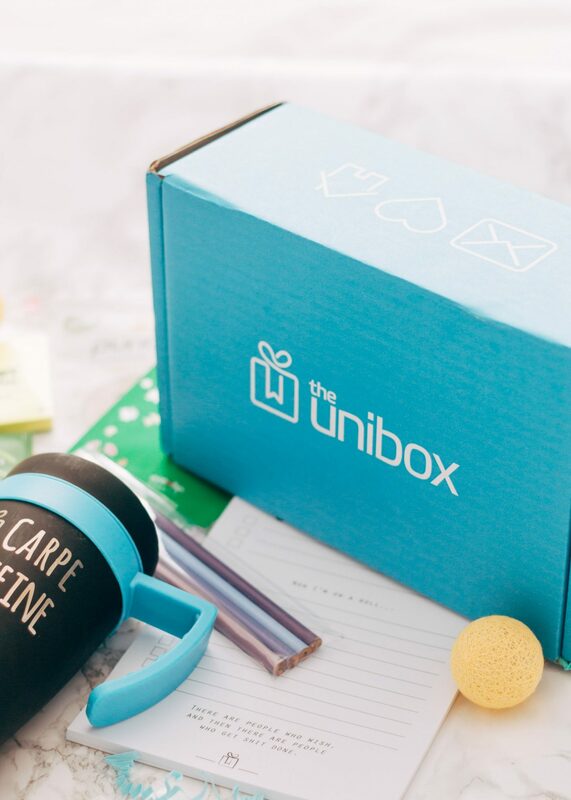 The Unibox is a monthly subscription box service, that delivers goodies and necessities straight to your door. Perfect for when you’re drowning in work! 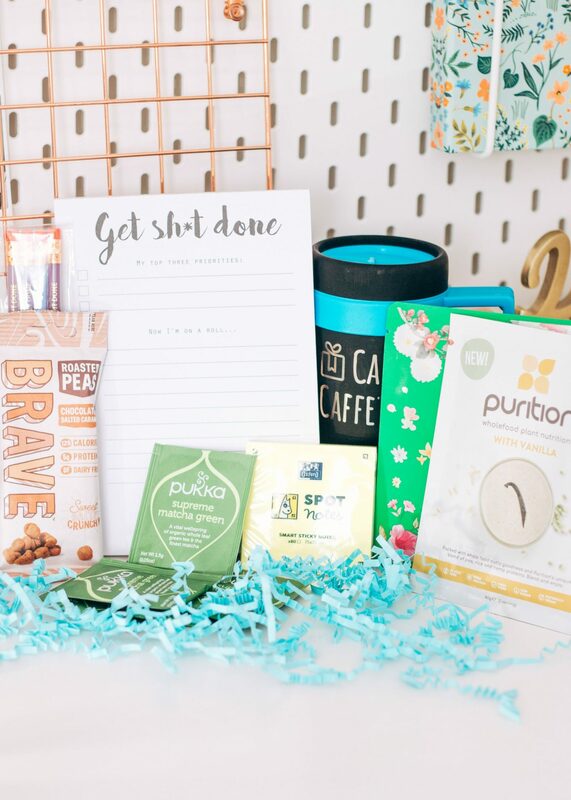 I know we’re in February now but I thought I’d share what was in the January box anyway, because it had some real goodies. So, lets get started. First thing I saw when I opened the box, was this Carpe Caffeine Travel Mug, which is perfect for us tired uni students who have 9am lectures. Gotta get that caffeine to stay awake! If coffee isn’t your thing, maybe you could try out some Supreme Matcha Green Tea. I’ve never had matcha before but I’m keen to give it a go, it doesn’t smell great but maybe I’ll be pleasantly surprised?! Taking a snack to a lecture is a must and this months box includes some Brave Chocolate & Salted Caramel Roasted Peas. I was quite skeptical about these at first because I mean, roasted peas? But alas, they’re actually really tasty and don’t taste anything like peas haha. Plus they’re vegan, woo! Moving on from the food and drink and onto study material. Look at these super cute pencils. They say ‘Get sh#t done’ on the top and I mean, if that isn’t some motivation, I don’t know what is. Alongside the pencils, there is a ‘Get sh*t done’ organisation pad, which I’m a big fan of. At the top of the page, you can write down your top three priorities for the day. I love writing down what I need to get done for the day, it gives me some structure and motivation to tick the tasks off the list, so I love this. The last bit of stationery included in the box, are these Smart Sticky Notes. I think every student needs some sticky notes, an essential. I use them to write down what I need to do in my sketch books, so they’re super helpful for me. Annndd, we have a face masks. Oh, I do love a good face mask. 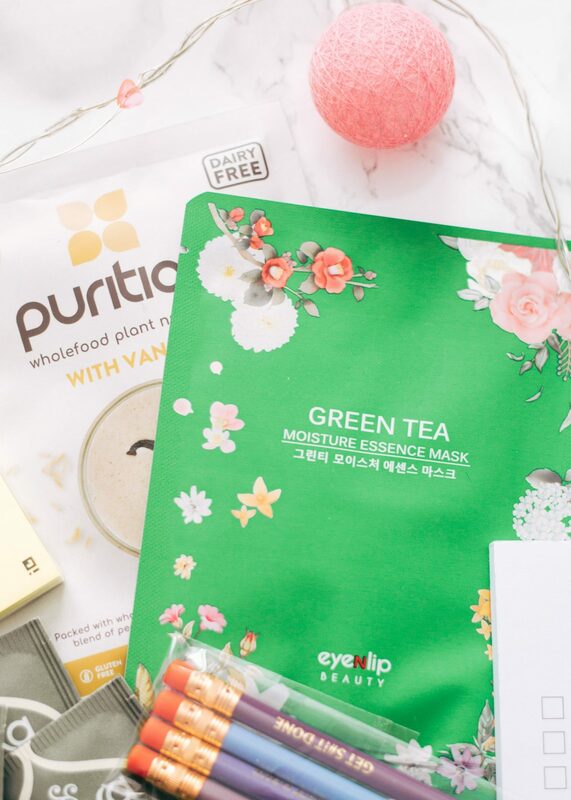 We have the Eyenlip Green Tea Moisture Essence Mask which is packed with goodness. Finally, a sachet of Purition Vanilla Protein Smoothie. I mean, you could make yourself a smoothie, do a face mask and you’re in for a cute pamper evening! I hope you enjoyed having a peek into the January box and I’m really looking forward to the February box, which is unicorn themed!